Fluffy and I looked at one another and blinked. We had not been aware that any help was needed. It was the third day of our six-day cruise, and the trivia pecking order had already been established. There were two teams that had won all of the competitions. One team was a five-person team from North Carolina that took trivia contests as seriously as Fluffy and I take Mormonism. This team, the “Tarheels,” told us they play trivia games three or four nights a week against different groups of people, and that they host trivia contests in their community. They watch “Jeopardy!” and other TV shows and even cartoons and TV commercials just to get trivia questions for their games. The other winning team was the “Virginia Hams,” a two-person team consisting of Fluffy and me. 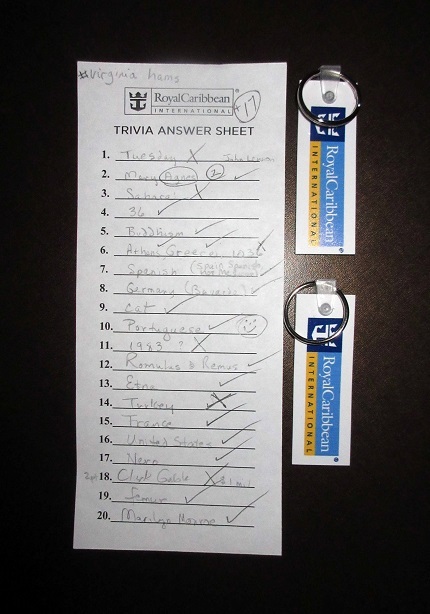 We had not played any trivia games whatsoever since we had taken our last cruise eleven months before. Although we have recently started watching “Jeopardy!” each night, we do not watch cartoons and Fluffy fast-forwards through all the TV commercials — even the ones I want to see. So we do enjoy trivia, but it is not a vocation or even an avocation for us. "Here is one of our winning score sheets — and our valuable prizes — before we started getting helped." But what can you do? Fluffy sighed. I looked up and assessed the situation. There were three interlopers — a man and two women, in their late sixties or early seventies. They looked fairly intelligent, but how can you tell? “Sit down,” I said, with another big smile that really meant, “Please go away.” “We’d be glad to have you.” And with those lying words, Fluffy and I knew we had lost any chance of winning the progressive trivia competition, which spanned several days and was the biggest trivia competition of the whole cruise. Ron looked at Fluffy as though he had sprouted another head. I could tell it was going to be a long trivia game. “What about the Chesapeake Crabs?” I suggested. Everyone else shrugged. It wasn’t an inspired name, but that’s the nature of teamwork. Everything is born of compromise. Besides, it matched my mood at that point. Then the game started, and the compromising really began. And that’s the problem with having people join us at trivia. Which is, we have to accept their help, even when their help isn’t helpful. We have to let them contribute. We have to play nice. Then we were asked which actor played the title role in the film Malcolm X. Even though we had not seen the movie, Fluffy thought the answer was Denzel Washington. But then, again with great conviction, another of our teammates said the answer was Jamie Foxx. So being polite, and not being 100% sure ourselves, we accepted that (wrong) answer. By the end of the trivia contest, we had accepted the strangers’ answers just enough times to be kind to them, which, coincidentally, was just often enough for us to lose that particular contest by two points. The thing about progressive trivia, though, was that we had to keep the same team for the duration of the cruise, which meant we were stuck with our teammates for two more games. We knew we were doomed. Sure enough, no matter where we hid ourselves in the Schooner Bar, our intrepid teammates found us on both those occasions. And on both those occasions they “helped” us go down in flames. For example, the juice from a strawberry (not a blueberry) will help whiten teeth. John Lennon was shot on a Monday, not a Tuesday. And the first Super Bowl game was played in Los Angeles (sorry, New Orleans). We finally decided we would press for the correct answer, if we knew it, and only defer to the other team members if we had no clue or weren’t sure. But by this time, it was too late. By the end of the competition, the Tarheels beat us so soundly that we weren’t even in second place. We still had a respectable score. I think we were about four or five questions behind the winners. But we were the fourth team in the rankings, and that made for a miserable showing. The Tarheels had ground us into the decking, and they knew it. It wasn’t even a fair fight. The thing about Ron and his two female companions is that they never did understand that they were the reason we lost the progressive trivia competition. From the beginning to the end, they thought they were helping us, and that our team just wasn’t as good as the three teams that scored higher than we did. They gave it their all, never knowing that their all was what caused Fluffy’s and my defeat. How many times have I thought I was helping someone, only to do exactly the wrong thing that was needed? I’m sure it happens all the time. Perhaps when Jane gets sick, she does not need my casserole. Maybe she needs to have her laundry done instead. Or perhaps instead of a visit, Claudia needs to have her children picked up from school and taken to Grandma’s. The list goes on. Does John really need a get-well card in the mail, or does he need a visit from a friend? Does the wife of a man who is in the hospital need someone to send flowers to him, or does she need someone to sit with him so she can go to the movies and get her mind off things for just two hours? When help is needed, the first thing we do is inventory our own set of gifts and see what we feel comfortable doing. Instead of looking at what is comfortable for us to offer, we should look instead to see what the person on the other end needs. Let her choose — and don’t be surprised if the answer is something that is not even on your list. The service that someone needs may be something you or I would never have thought of giving. I remember an act of service that my friend Michelle gave me way back in 2011 — back in the days when my worst physical ailment was congestive heart failure, coupled with a nasty case of pulmonary hypertension. Okay. Both of those were fatal diseases. I couldn’t walk ten paces without having to sit down and rest. I was a lot worse off then than I am today. Today, my worst problem is that I temporarily don’t have the use of my feet. Early that month, the mother of a mutual friend died. I knew I should go to the funeral, but this was before my coma, and while Fluffy was still working and couldn’t get the time off. I couldn’t take myself because I couldn’t park a car and get from a parking lot into a church. Even then, I needed to use a wheelchair, but I didn’t have a wheelchair except for a “transport wheelchair” that somebody else had to push. Out of the blue, Michelle gave me a call and asked if I wanted a ride. She would give me door-to-door service from my home to the Catholic Church to Arlington National Cemetery to the country club where the funeral luncheon was going to be held, and then home again. I thought it was a great idea to spend some time with Michelle, who is even more of an introvert than I am. It was a real sacrifice for her. That day became one of the best memories of my life. The day was snowy and cold and miserable. Michelle and I laughed and took pictures and acted like idiots (acting appropriately solemn when solemnity was called for, of course). She pushed me everywhere, and I am not a lightweight person to push. The gift of her time was a treasure. I will love Michelle for the rest of my life — and beyond. We, too, can give gifts of our time and our hearts. All we have to do is think outside the casserole dish, and we can change a person’s life forever.